The Marine (Tribute-Memorial) bike was on display before the Carmen Ramputi Marine Corps League annual dinner to celebrate the 233rd birthday of the United States Marine Corps. New Windsor resident Larry Tremblay Sr. built the tribute bike for his son Joseph Tremblay, who died in Iraq defending our nation. 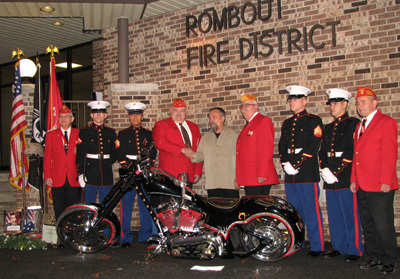 The bike has been viewed by many at the following events, the Military Order of the Purple Heart, in Tarrytown NY, International Waterfront Fest, in Newburgh NY, Marine Corps Marathon in Washington DC and at bike shows in Portsmouth NH, Wildwood NJ, Orchard Beach NY and Atlantic City NJ.